Decking out one's home in a style that is pleasing and easy to live with, is not an easy task. 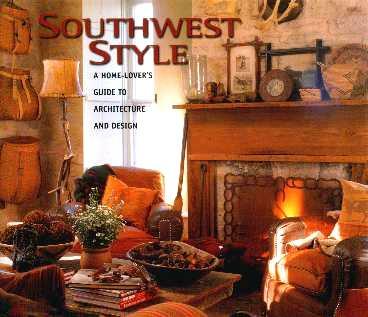 If you fancy a rustic style typical of the southwest, then this book will ignite your creative flame. There's something to be said about the bright colors and desert influence in one's home, and many of the homes featured in this book are truly comfortable-looking and very appealing. Not only are we treated to the delightful interiors, but we're also given a history of the southwestern region, architectural details, and plenty of ideas too. The photographs are magnificent and you're willingly drawn into the subject. If you are not able to join those who've trekked across the country in search of a new life in this spectacular part of the world, you can transform your own home, no matter where you happen to be, into a comfortable southwest style. We're told what a pueblo and an adobe home is, the difference between Victorian and territorial style, and much more. My favorite home is on page 28 and my favorite room on page 72 - I could move in tomorrow! The outside garden I adored is on page 165. This is such a special part of the country, rich in native history that has a spiritual effect on many who both visit or pass through the various areas. Photographer Peter Vitale, whose fabulous work is featured in this book, shows off his own enviable deck on page 5. Conclusion - A magnificent collection of southwestern homes. Very different.